In other news, more basic research on CRISPR has revealed that the Cas9 enzyme – the protein that makes the cut in DNA – of a bacterial species called Neisseria meningitidis can also cut single strands of DNA (Zhang et al., 2015), in addition to its expected role of cutting double strands of DNA. This is of interest because it allows a wider range of applications, especially considering that N. meningitidis Cas9 is considerably smaller, and therefore easier to handle from an experimental point of view, than Streptococcus pyogenes Cas9, which is currently the most commonly used Cas9 version. In particular, Nuñez et al. found that the Cas1-Cas2 complex acts as a molecular ruler to determine the length of DNA that is incorporated into the E. coli genome. 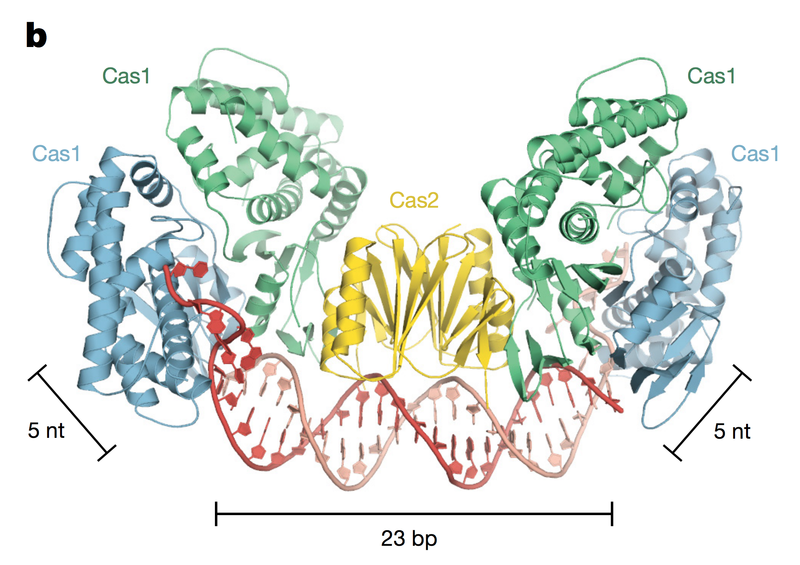 Furthermore, they demonstrate that Cas1 can pry open the ends of the DNA, as seen in the image above, so that Cas2 – which is catalytically active – can gain access to the reactive ends of the DNA. So here is yet another example of how the structure and function of proteins are intricately connected and often knowledge of one can enhance knowledge of the other. This entry was posted in CRISPR, Factual and tagged Cas1, Cas2, Cas9, CRISPR, Crystallography, DNase H, Doudna, Genome-editing, Neisseria, Pig organs, Structural biology, transplantation by Victoria Wang. Bookmark the permalink.